When systems are exposed to and are in contact with aggressive chemicals that are highly corrosive, standard fittings can become severely corroded putting the entire assembly at higher risk of early failure, resulting in expensive equipment downtime. 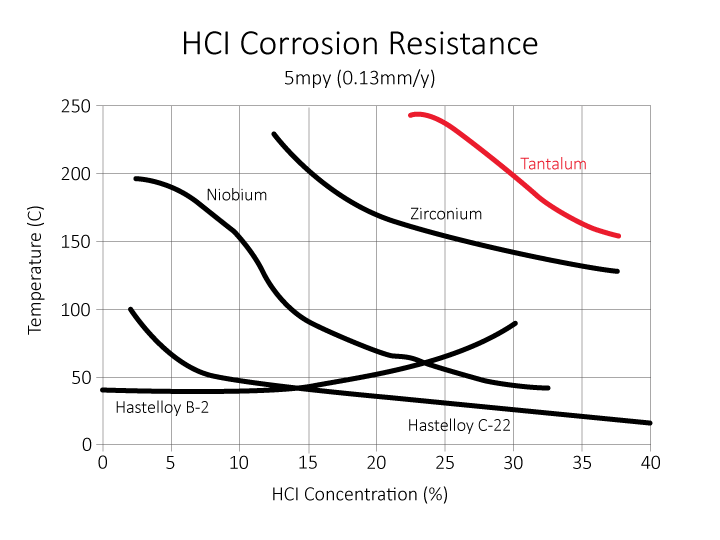 Tantalum surface layer applied by the proprietary Tantaline® treatment process provides superior corrosion resistance, strength, and leak tightness for extended service life in hot acidic environment. Tantaline® treatment for corrosion resistance is a cost-effective substitute for exotic alloys to achieve long term corrosion resistance and reliable sealing for the various fitting types. Tantaline ® treatment uses high-end Chemical Vapor Deposition techniques to deposit a uniform, diffusion bonded layer of corrosion resistant tantalum onto very intricate shapes and smaller sizes of fittings while maintaining critical tolerances. Tantaline® treated fittings offer better corrosion resistance than austenitic stainless steels which cannot fight stress corrosion, chloride attack, and especially sulfide cracking. The metallurgical properties of the tantalum surface combined with the uniform and conformal CVD layer results in superior acid resistant fittings that have excellent compatibility in most aggressive acids and can be offered with economical pricing and short lead-times. A wide range of styles and configurations are suitable for Tantaline® treatment.